there's only a few things that can compare to the joy that comes with a new pair of shoes. did i hear someone say "shallow, much?"... i choose to ignore you, 'coz i've got happy feet, and i'm no penguin. "thou shalt buy not new clothes until thou hath lost-eth all thine extra weight. Eth". this was necessary. getting myself pretty new clothes every time i put on some weight was only leading to a shrinking wallet and an exploding wardrobe...and waistline. what happens next is heart-wrenching. "i have nothing to wear," she said, staring vacantly at a closet so full it could die. someone had to put an end to the madness and the constant whining. since positive reinforcement was clearly doing otherwise, i decided to climb on to the wagon of constraint. and that is how i bid farewell to one of generation-SATC's most reliable forms of therapy. will-power is not something i can boast of. so, to be fair, my new life of abstinence is partly a product of there being no other choice. don't you just hate it when you like something at a store and try it on and it just looks wrong? and you know it's because you could stand to lose a few. you might end up taking the next size they have, thinking "hey if i'm going to look like a tent, might as well look like a pretty tent"... except you still look like a tent. FAIL! fine. seriously, no new clothes until the trips to the gym start showing. according to our good friend wiki, retail therapy is shopping with the primary purpose of improving the buyer's mood or disposition. it's not the same as being a shopaholic. plus PMS does not understand concepts like 'operant conditioning' or 'will power' or 'abstinence'. how can you 'nurse your psychic ills' without therapy? those wonderful friends who keep your feet on the ground (prettily, i might add). those shiny sparklies that take your mind off what you can't have. those gorgeous beings that don't keep shoving the fat-card in your face! that's why women love shoes. and that's why allan sherman said, "you want to fall in love with a shoe, go ahead. a shoe can't love you back, but, on the other hand, a shoe can't hurt you too deeply either. 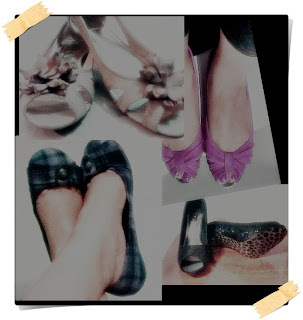 and there are so many nice-looking shoes." and that's what i did last weekend. i went and bought four pairs of shoes. <3 love is in the air. So true, babe - Bought a new pair too - they're silver. Clothes on the other hand...eh!